It’s a hot water with lemon and honey type of morning over here. I am most definitely fighting some type of head cold with symptoms of stuffy nose, sore throat, and “stuffy” throat if you know what I mean. I will NOT get sick(er) though, and I will fight it off (positivity really helps!). I’m thinking it should be a fruit and veggie-packed smoothie kind of morning too to get a kick-start on those vitamins. Let’s talk about Monday. First thing in the morning our pampered pooch had an appointment at the vet. He was less than thrilled about it as you can see. It was time to get his pearly whites cleaned up. Although we do brush his teeth and give him Nylabones and other bones to chew on, he still has some buildup on his teeth and has grade I gingivitis. The vets highly recommend the teeth cleaning because gingivitis can lead to further serious health conditions if not controlled. Since we love the little guy SO much, we dished out the dough and got it done. His teeth turned out beautifully. I had some running around to do throughout the late morning/lunch hour, so I stashed some snacks in my purse: carrots, snap peas, and an apple. I had quite the little day and I am excited to share it with you very soon. There aren’t too many food photos to share with you from yesterday because my day of eats was too random and not the most balanced either, and I didn’t feel like snapping a photo of every little snack I consumed. I was finally done with all of my appointments and errands at 4:30 at which point I had planned on getting a good core workout in, but by the time I got home I was in no mood to do anything strenuous. My energy was zapped and I was starting to feel symptoms of the cold. But I wasn’t ready to call all exercise off, instead I laced up and headed downstairs for a leisure walk on the treadmill while reading a book. I walked for 45 minutes and completed my plank-a-day, and was so glad I did. It gave me the little boost of energy I needed. When do I ever regret a workout? Never. Dinner was something special last night. My friend Patti read that I was trying to eat salmon once a week and trying to learn to like it, so she recommended a recipe for me to try. It was very simple which I always appreciate. What I did was melt a little butter on the stove top, add sliced almonds, capers, and finally sesame oil. It doesn’t take long to make the sauce so I waited until the salmon and green beans were nearly done on the grill (yes we grilled last night—wooo!—no salmon stinky house) to get it going. Once everything was cooked I plated the green beans which I just steamed in aluminum foil on the grill, then the salmon, and finally the almond glaze. So, guess what? 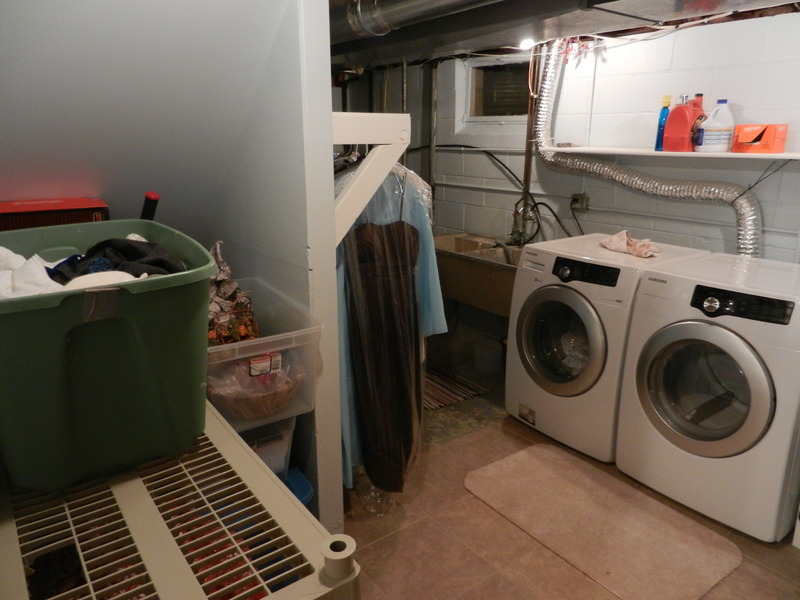 The laundry room is finished! It took us about two weeks to complete and it feels so great to have it done. Before the renovation, the room was dirty, cold, unorganized, and you felt like you had to wear shoes if you were going to go in there. Now, the floor is tiled, the walls and shelves are all painted, and all of our “junk” is organized! 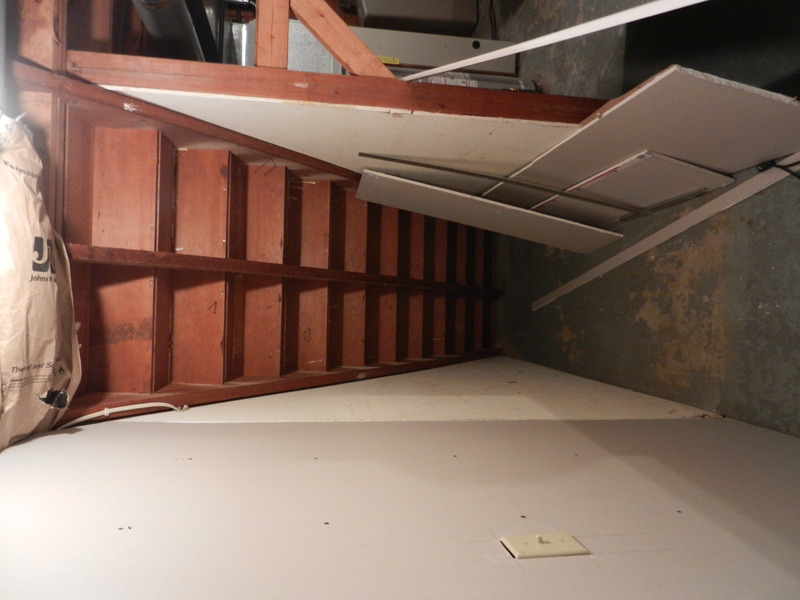 Who knew I could be so excited about a laundry room renovation! How times have changed. These photos are a little embarrassing because you are witnessing firsthand all of the junk that we own. It amazes me how much stuff two people can accumulate. My next project is to sort through all of this stuff, hopefully get rid of a bunch of it, and then reorganize it again. Okay, I’m going to go nurse this throat and get ready for the day. I hope you all have a great Tuesday and are feeling healthy! This entry was posted in Dinners, Home Life and tagged February Fitness Challenge, Home Improvement, salmon, treadmill walk by Melanie. Bookmark the permalink. Blech, it’s no fun but misery loves company! 😉 Hope you are feeling better.